The song says that “girls just wanna have fun,” and a getaway weekend is no exception. Find out what you need to pack—from a bottle of vino to your favorite bikini—to help make that happen on your next girls’ trip. Ladies, is there anything as fun as a girls’ getaway trip? I think not. There’s just something magical about taking a trip with your closest friends and leaving your cares at home. No relationship drama here, please and thank you! That said, packing for a girls’ weekend can be daunting: We all have so much stuff, meaning space conservation can certainly become an issue. 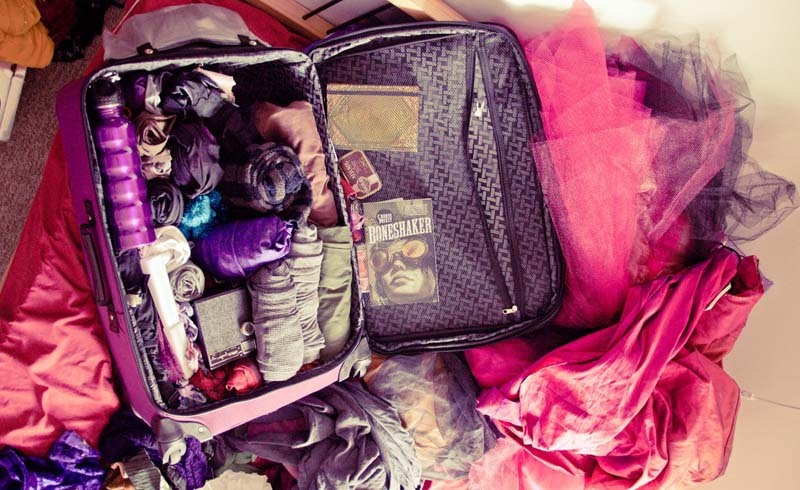 So before you hit the road with your besties, check out these tips on what to pack and how to pack it. You’ll probably be sharing a hotel room or cramming into a vacation rental, so make a pact to bring one bag apiece to save on space. Picking the right bag is essential: You want one that’s roomy and full of storage space, but no bigger than a carry-on—especially if you’re carpooling to your destination. TheConverge™ Weekend Bag will definitely do the trick: With zip-away backpack straps, you can switch between a duffel and a backpack as your needs dictate. To keep everything inside your bag organized, fill it strategically with packing cubes in various sizes. Pack your clothes and swimsuits in compression cubes to save space, then use dedicated cubes for things like your shoes and toiletries—keeping any dirt or potential leaks safely away from the rest of your things. If you’re going to the beach (my favorite destination for a girls’ getaway), packing your cutest swimsuit is a must. Aside from that, a few sundresses in a material that won’t wrinkle, an adorable cover-up, and a pair of shorts with a couple coordinating tanks (one casual and one dressy) will see you through the weekend in style. Don’t forget your flip-flops for scooting around in the sand and one nicer pair of shoes if you plan to hit the town. Even if you plan to go to restaurants, it’s always a good idea to have some food and drinks on hand to enjoy between meals. Toss a bottle of wine or your favorite non-alcoholic beverage in your bag (unless you’re flying, in which case you’ll have to get it when you arrive). Tell each of your friends to bring her favorite variety as well, and have your own happy hours in the evenings! And snacks are a must: Coordinate with everyone to bring a few goodies apiece, and you’ll be fully stocked. Don’t forget the makings for s’mores to be consumed around a sunset bonfire, if you’ll in a place where you can make that happen! Make sure to bring a deck of cards: You can easily slip it into your bag’s pocket, and it’s perfect for late-night entertainment. And check ahead with your lodging to see if they have a DVD or BluRay player, or even a way for you to connect a streaming device. If so, bring along a crowd-pleaser movie like Magic Mike that will have your whole group cheering. Make a playlist on your phone or tablet, and have it queued up for impromptu dance parties in your pajamas. Packing smart for a girls’ getaway is the key to keeping yourself organized and focused on the important stuff: having fun and bonding with your friends. Your turn, readers: What are your must-haves for a getaway weekend with your best friends? Let me know in the comments below!